Home / Vacation / Vacation Food Blog! Barcelo Puerto Plata, Dominican Republic! Vacation Food Blog! 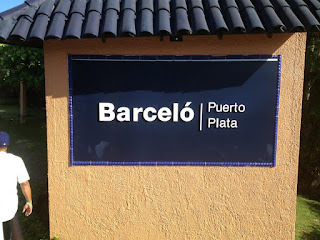 Barcelo Puerto Plata, Dominican Republic! So, I went on a well overdue vacation to the Dominican Republic and I realized it shouldn't be a vacation from blogging too! The resort was beautiful. The people were very friendly. Now that I've got the basics out of the way, let's get to the food. We tried the Italian, Seafood. Pizzaria and Oriental a la carte restaurants on the resort. We didn't get to try the Mexican or Brazilian. If you've been to an all-inclusive resort, you've gotten tired of the buffet. Some resorts limit the amount of visits to the a la carte restaurants, so there you are...back at the buffet...again. Barcelo changes it everyday. Each night, the buffet is a different theme, so you don't get sick of it. All of the food is pretty good. Some dishes can be a bit salty. Here's the rundown. Breakfast: Omelette bar! Get your omelette made to order. They also have all of the usual suspects, french toast, pancakes, fruit, juices, various forms of pork, oatmeal, sausage, yogurt, etc. There was also items that many North Americans wouldn't have for breakfast: cooked vegetables, beans, and salad, to name a few. They also make fresh fruit smoothies. DRINK THEM. Banana, Mango, Pineapple, etc. They made 3 kinds each morning. The banana was my favourite. They are made with ice, whole fruits and milk. That's it. Lunch: They serve a variety of fruits, salads, prepared vegetable dishes. Where's the meat, you ask? There's lots of it. On the grill at lunch, it is different each day, sometimes fish, chicken, chicken wings, etc. If you are looking for a different option for lunch, there is a Grill near the beach. It serves burgers, sausage, salad, corn on the cob, etc. Dinner: This is the best meal of the day. The pasta bar! The giant hunk of meat! The grill! The potatoes! Think boiled potatoes are boring? Think again. They must be boiled in butter, because these are the BEST potatoes I've ever had and I miss them dearly. If you are getting fresh pasta made, ask for no salt. The pasta there is AMAZING. EAT IT. Wait, pasta in the Dominican? I said the same thing until I tried it. Mmmmm. My boyfriend ate it everyday. We enjoyed this restaurant so much, we went twice! It is indoors and richly decorated in deep red and gold. For anyone that is not chopstick savvy, you WILL have to ask for a fork. Heehee. Get practicing! When you arrive, you are served a plate of assorted yummies. Tender chicken skewers, spring rolls, shrimp sashimi and some odd sushi rolls. The rolls included things like cheese, deli ham, green beans and cantaloupe. A crowd favourite is the Chicken or Beef Lo Mein. Beef Lo Mein is pictured here. The meat was tender, vegetables crisp, sauce saucy. The noodles were spaghetti noodles, not lo mein. Made me giggle a little. Another popular dish is Sweet & Sour Pork. Tender and delicious, but if you prefer chicken, don't be afraid to ask. Dessert! Forgive me if I forget the exact names. We tried the Orange Mousse, Fried Banana with Ice Cream and Coconut Custard. The mousse was light and fluffy, but the portion was very small. The banana is where it's at! The batter was light and banana warm. The coconut pudding was tasteless cubes of blah. Don't let that get you down. This venue is right on the beach. It's the Grill for lunch, Seafood for dinner and the Disco at night. That being said, it's outdoors! Calamari, calarmi, calamari! I would hate to know how much they go through. It is, by far, the most popular dish there. I understand why because it was DELICIOUS! Not greasy, crispy light batter surrounds tender pieces of calamari. I want more! A friend and I tried the Seafood Cannelloni. We couldn't figure out what was in it. We think there was shrimp and maybe calamari in it, but we weren't sure. It was good! Not a seafood person? They offer steak, chicken and pasta dishes. Another friend ordered the chicken. There was little talking over dinner. It was very good. None of the desserts tickled our fancy, so we all got ice cream. To start we chose caesar salads. I was so hungry, I ate it before taking a picture. It was made with iceberg lettuce, but the stars of this show were the croutons. They were deep fried and addicting! I selected the Chicken Stuffed with Cheese and Spinach and my man went with the manliest dish, steak. I was surprised by the small portion, since everything else was in abundance. Looks were deceiving, I was stuffed! My man loved the steak, cooked to order and served with those butter potatoes. His only complaint was the sauce was a bit peppery. We ordered different desserts. I went with the Tiramisu. My boyfriend was a little lost. Some things weren't translated very well on paper or through the server, so he just picked one that said 'chocolate' in it. The tiramisu was moist with just the right amount of coffee flavour. Now, the other dessert was...different. It was 2 dark chocolate sandwiches with whipped cream in the middle. I guess you really can't complain about chocolate, but this wasn't what we expected. Sadly, another I did not get pictures of due to hunger. The sadder part is that I was there more than once and still failed to snap a photo. The pizza was very good. Super thin crust baked in a stone oven. The toppings were fresh and if you went too late, some kinds were unavailable. I thought I'd never eat a whole one, but the crust is so thin anyone can polish one off. If they ask you if you have a reservations, YOU DON'T NEED ONE! The others require a reservation. It's open in the evening, weather permitting. So, that's it! I don't know about you, but bad food on vacation can really damper the experience. Luckily, our food experience was excellent! Hopefully I won't write another blog that long until my next vacation! Phew!